Our school has a deep commitment to the health of women and their families in Washington and beyond. As part of this commitment, we have been proudly educating nurse-midwives since 1993. We have graduated more than 150 nurse-midwives, many of whom practice in Washington. I am writing today to let you know that we are working with the Accreditation Commission for Midwifery Education (ACME) to renew the accreditation of our Doctor of Nursing Practice-Nurse-Midwifery and Nurse-Midwifery Certificate Program. This is a 10-year re-accreditation and separate from that of the DNP program accreditation by the Commission on Collegiate Nursing Education (CCNE). In accordance with ACME Policies and Procedures Manual, and the US Department of Education’s requirements, ACME is seeking written third-party comment concerning the qualifications for accreditation of the University of Washington nurse-midwifery programs. The programs will be reviewed for renewal of accreditation at the July 2018 ACME Board of Review meeting. Upon request, comments will be considered confidential. Your comments will be included with the materials submitted by the program for review by the Board of Review. In all instances, your comments must directly relate to the continuing accreditation of a program and the ACME Criteria for Programmatic Accreditation, (December 2009, Revised June 2013, April 2015). This document may be found at www.midwife.org/Accreditation under ACME Documents. Please cite the particular criterion of concern in your comments. Our Doctor of Nursing Practice (DNP) program offers a track in Nurse-Midwifery (NM), which prepares nurses as primary care providers for women throughout the lifespan. Some become researchers, others educators, though the majority pursue clinical practice.Nurse-midwives practice in many diverse settings and provide a wide range of women-focused healthcare services. In addition to assisting with the birth process itself, nurse-midwives offer a full spectrum of gynecological and preventative care. This range of care includes routine examinations and treatment through pre- and postpartum counseling and peri- and postmenopausal care. Some nurse-midwives become researchers, others educators, though the majority pursue clinical practice. 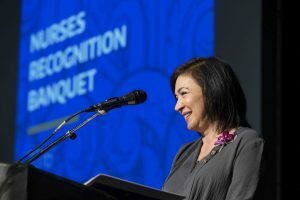 We offer a graduate certificate in Nurse-Midwifery to experienced advanced practice nurses who want to expand their scope of practice and learn how to provide a wide range of healthcare services for women, including assisting with the birth process as well as routine preventative care. This graduate certificate is for individuals who are looking to expand their existing scope of practice as an APRN and are currently a clinical nurse specialist, nurse practitioner or nurse anesthetist.